Wow! Are these DT ladies talented or what?! I'm honored to share this space with them, and show you my creations. This is one of the first Halloween cards I have ever made. When the set Trick or Treat and Pumpkin Face Mix-N-Match came to me, I was so excited. 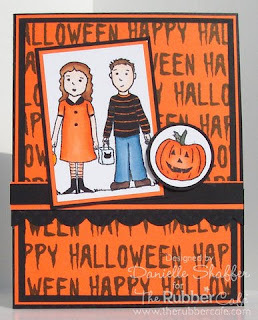 First, I used the sentiment from Pumpkin Face Mix-N-Match to stamp out the background in black ink on a nice crisp orange cardstock...quick and easy! 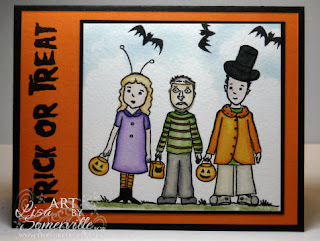 Then, I stamped the images of the kids from Trick or Treat on Neenah paper and coloured them in with my copics. Of course, I tried 4 different colour combo's before I liked his little shirt! The little pumpkin is also stamped on Neenah paper and coloured with my copics. I used a sketch from Mojo Turns 100 - Day 6. I stamped the sentiment in Black on the White base card, added the Black panel. On the top edge of the Red panel I punched using the Spiral Punch and folded the edge over. The Poppy was stamped in Black on Red and Green card stocks then cut out and placed on dimensionals on the base panel. 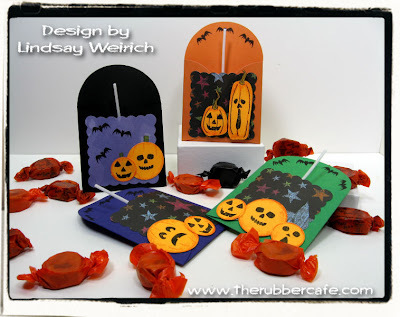 Do you want to make an invitation with a bit of pizazz that is quick and easy too? Try these pocket cards! They are so simple. Just draw a big circle on 12x12 double sided pattern paper and cut it out with scallop scissors, then cut that in half to make two cards. Fold each half circle in thirds and adhere the top flap and inside bottom to make a pocket. I used my Scor-pal to get strail folds. 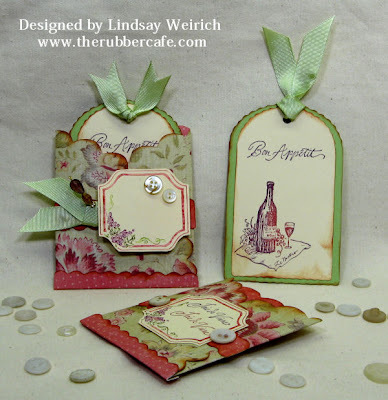 Die cut or use a template to make the tag and stamp. You can write your info on the tag, easy peasy! If you want more detailed directions and templates click here. 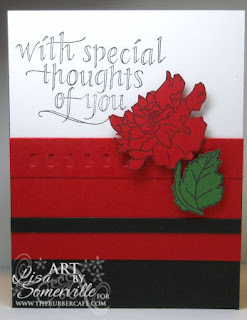 I used the Bon Appetite set to make this card and I love it, it is so classic and pretty, it will still be in style ten years from now and since it is high quality red rubber it will still stamp perfectly in ten years too! BTW this pocket card would be perfect to stick on a scrapbook page for hidden journaling and the set would compliment Thanksgiving pages perfectly! 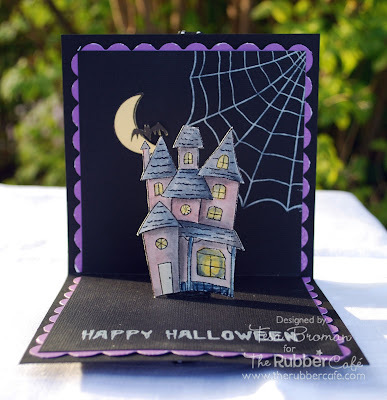 I've tried making one of the oh so popular pop up cards with some of my favorite Halloween stamps. I agree with Michelle (check out yesterday's post!) that the Bat Motel is super fun to work with. And it is PERFECT for a pop up card! But before reaching the Bat Motel, one needs to fight Mr Bones (You shake my bones is the full name). 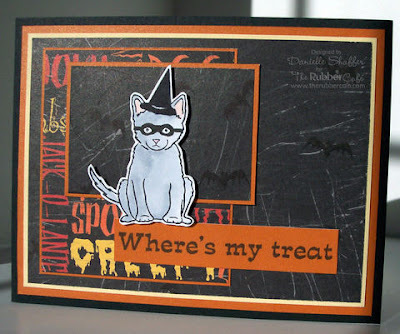 He is stamped with white ink and embossed with clear embossing powder to get a little transperant look. Pop Up Cards are really fun since they look like lots of work, but are in fact really simple to make. There are tutorials all over blog land. 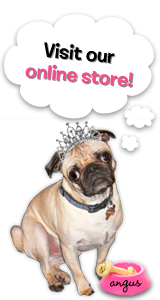 You can find one on SCS here. Try it out if you haven't already! I kept the inside kind of clean. The spider web with the oh so clever name "You need to dust" is clear embossed like Mr Bones. And the Moon stamp, Just Batty, is stamped, colored and cut out and adhered on the back of the card. 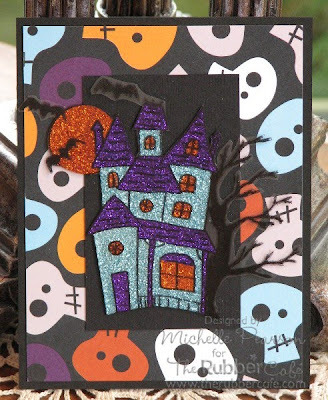 I finished it with the Frightful Halloween stamp. That's about it. But sometimes, it can be really neat to keep it simple! This bat motel has to be one of my favorite images for halloween! I love coloring it and it was also a super-fun image to use for the glitter and acetate technique! For this technique, you simply stamp the image on acetate with black Stazon ink. 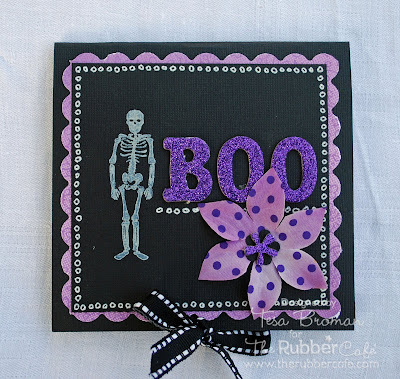 Flip it over and apply glitter as desired, let dry, cut out and you and up with a very fun card embellishment! I use glue dots to attach my image. 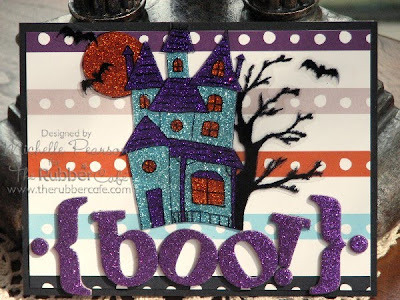 Here is another take with the glittered Bat Motel! 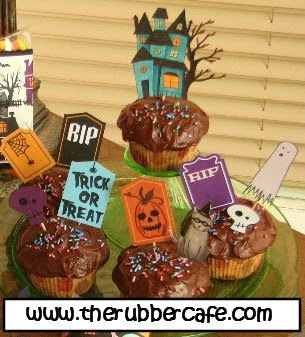 Finally, here are some cuppy-cake pics that I made using designer paper and stamped images. Here I colored the Bat House with Copic Markers since I didn't want glittery cup cakes! I also used Charming Kitty, Pumpkin Face Mix-n-Match Set, and Trick or Treat Set. Hope you've had fun peeking at some spooky treats! Today's card features the cute Trick or Treat Kids from The Rubber Cafe. They are stamped in Black Archival on Watercolor paper, then colored using the Marker Watercoloring Technique. (Gotta LOVE that technique!). The clouds behind my image were created by sponging ink around a punched scallop. It's hard to believe Summer's come to an end already! I think Michelle's creation captures the season wonderfully! 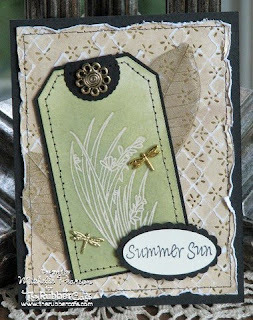 Michelle used the gorgeous stamp "Grass Edge" from The Rubber Cafe' for this card. She used chalk to create the white image. She has all the specifics on her blog. The distressed edges and stitching really set off the design!